Iori Yagami (八神 庵) is the heir to one of the three clans that sealed the legendary snake entity, Orochi, 1,800 years ago. As the leader of the Rivals Team he is a central reoccurring character and the initial enemy -and eventual rival- of Kyo Kusanagi. Iori is the current descendant of the Yagami clan who wields one of the three sacred treasures that can seal the legendary snake entity Orochi. While Iori was training, he heard of numerous exploits by the current heir to the Kusanagi throne, Kyo. One of them was his entrance into The King of Fighters '94 tournament. Iori perceived this as an excellent chance to kill Kyo. To accomplish this, he entered the tournament with Billy Kane and Eiji Kisaragi, forming the Rival Team. Unfortunately, when the Rival Team failed to defeat (or, by some accounts, to even fight) the Heroes Team, Iori subsequently became extremely angry. This anger, along with his extreme hatred for Kusanagi, and the presence of Rugal Bernstein's Orochi power, cause him to give in to his Riot of the Blood. He soon beat both Billy and Eiji within an inch of their lives before angrily marching off to find Kyo. He then arrived at the secret underground base where Kyo was fighting the host, Rugal Bernstein, and recognized the presence of Orochi blood within Rugal. This made Rugal very formidable, but as he was not born with the power, he could not contain it. Iori said the classic phrase: "Only those of the bloodline can control such power. You didn't have a chance!" as he saw Rugal wondering why his own power was consuming him. Iori's phrase gave birth to the Orochi saga in The King Of Fighters. The next year, Iori trained strenuously, practicing nearly to unconsciousness, convinced he would triumph in the next tournament. While training, Iori was confronted by two women. Iori recognized Mature as one of the secretaries that were with Rugal. Both then revealed to him that they were servants of the Orochi. Vice, the other woman began attacking him when he demanded that they get lost. While Iori was enjoying the ferocious attacks of the weird and elegant woman, Mature told Iori that they had been observing him, and that he would be perfect as their teammate in the next King of Fighters tournament, as they all were genius and sadistic fighters. In the course of the KOF '96 competition, he eventually faced the "Heroes Team", composed of Kyo Kusanagi, Benimaru Nikaido and Goro Daimon. However, the ensuing fight was brief; Chizuru Kagura of the Yata clan quickly took his rival away to confront the threat of the impending Orochi. Iori immediately sought out Kyo again, and found his rival fighting against Goenitz. Iori recognized the power as the same that had destroyed Rugal, and he knew it had to be related to the Orochi. Iori then joined in Kyo's attack on Goenitz. With a double blow of crimson flames, Kyo and Iori defeated Goenitz. As he was standing bleeding, he told the two men that he had underestimated the power of the Yagami, and that Yagami was a dangerous man, that as long as he possesses the Orochi power Goenitz would have power. Iori, not amused by this at all, started to make fun of Goenitz, but saying his final words, he disappeared. Still deeply disgusted, Iori walked away, and when he was walking his teammates, Mature and Vice, started to fade into the Riot of the Blood again. Unable to control this surge of Orochi power, Iori killed his companions violently. After the two murders, Iori disappeared for a year, continuing to suffer from multiple outbreaks of the Riot of Blood (resulting in a number of fatalities). 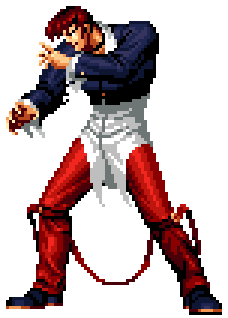 Iori learned he had been entered in the next King of Fighters tournament of 1997 as a single entry. Iori was convinced that the responsible agent was Chizuru, who was likely thinking he might help her again. However, not much later, Iori once again entered the Riot of Blood, and went into a berserk rampage that grew and grew with the presence of Orochi. With much difficulty, the other fighters were able to calm him down through force. Immediately after gaining consciousness again, Iori found himself along with Chizuru and Kyo confronted by the New Faces Team, composed of Yashiro Nanakase, Shermie and Chris, which then turn into their Orochi forms, revealing themselves to be the 3 last and most important servants of Orochi, who are meant to revive him once and for all. Through the combined efforts of Kyo, Iori and Chizuru, they eventually are able to turn the tide against the resurrected demon and seal Orochi again. Orochi Iori uses the same moveset as normal Iori, but he moves faster and can combo moves that cannot be used as a combo normally. This page was last edited on 24 February 2010, at 10:21.